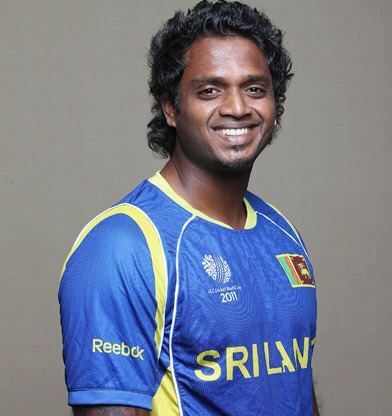 Congenige Randhi Dilhara Fernando (born 19 July 1979), popularly as Dilhara Fernando, is a professional Sri Lankan cricketer playing for Tests, ODIs and T20Is in international arena. He is a right-handed pace bowler. He was a key member for 2007 ICC Cricket World Cup and 2011 ICC Cricket World Cup runner-up teams. Fernando is best known for his rare technique when bowling the slower ball by splitting the fingers on the ball as it is releases. In 2008 he appeared briefly in English county cricket, playing one County Championship and two Pro40 matches at the end of the season for Worcestershire. Fernando debuted for Sri Lanka in a Test Match against Pakistan at Colombo in June 2000. Six months later in a game at Durban he clocked 91.9 mph. He bowled at 93.40 mph vs Bangladesh at India. His international career however has been limited due to injury. In the period of a year he suffered two stress fracture of the back and as a result missed their home series against Australia in 2004. In the 2010 tour of Australia, in the 3rd and final ODI at the Gabba, he clocked speeds reaching 150 kilometres per hour (93 mph). On 13 October 2007, in the 5th game of an ODI series with England, at Colombo, Fernando took career-best bowling figures of 6 for 27, as Sri Lanka thrashed England by 107 runs. This was the first time Fernando had taken more than 4 wickets in an ODI innings, and his feat placed him 5th in the list of best ODI bowling by a Sri Lankan. During 2007 Cricket World Cup against England, he guided the team into winning margin by just 2 runs. England required just 2 runs in the last ball of the match, where Ravi Bopara in batting. Fernando delivers a good ball and Bopara was bowled by 2 runs short. Fernando completed the series with 158 career ODI wickets. As of 17 June 2011, only Chaminda Vaas, Sanath Jayasuriya and Muttiah Muralitharan have taken more ODI wickets for Sri Lanka (and all three have taken over 300 ODI wickets). After 3 years, Fernando have picked for the T20I series against India. He played his first international games after 4 years, on 14 February 2016 against India. Due to few runs posted by Sri Lanka, he was not able to get wickets and Sri Lanka lost the match by 9 wickets as well. Dilhara was educated at De Mazenod College in Kandana, a suburb of Colombo. He started off his school career as a basketball player but was recruited to play cricket because of his build and height.